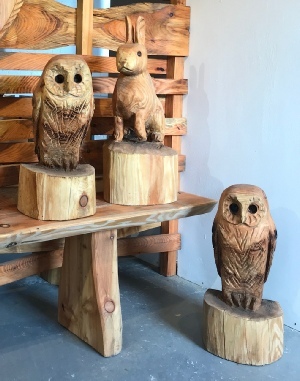 Forge Arts is the main supplier of chainsaw sculpture and carvings by talented chainsaw artist, Mick Burns. Much of Mick’s work is usually large scale sculpture of a very varied nature or theme, e.g. animal, figurative, abstract, unusual benches, entrance ways, theme poles, trail markers, memorials etc. 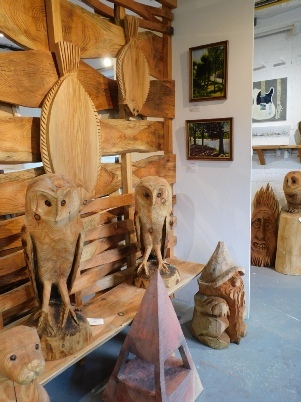 However, when possible, he produces smaller garden sculpture and furniture for sale at Forge Arts. Mick’s sculptures are all different; no two are exactly alike. 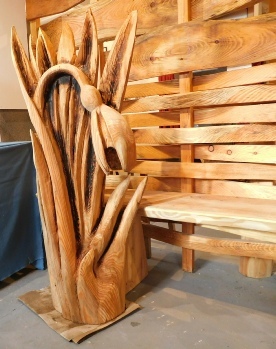 This is because each carving is based on a unique piece of wood, it is impossible to exactly replicate any particular item.The timber used is normally from UK plantations managed specifically for timber production. UK forestry is carefully regulated by the Forestry Commission and is a totally sustainable timber resource. Mick also uses timber that has resulted from the removal of dead, dying, diseased or dangerous trees, effectively re-cycling the timber rather than burning it or dumping it. A range of Mick’s garden sculptures, furniture and smaller carvings are available from Forge Arts, subject to availability. Commissions are undertaken and work can be pre-ordered. We recommend that sculptures are pre-ordered especially if required for Christmas or as a gift for an anniversary or birthday in order to avoid disappointment.